After they had beaten Italy and German in North Africa, the Allies planned their next step, the invasion of occupied Europe and finally defeating Germany and putting an end to the long and costly World War 2. The Allies were set on attacking Italy in the hope that it would drive away the fascist government, and push the German troops from the northwest region of France which the Allies wanted to attack. The first step in the invasion was the Battle of Sicily, aka Operation Husky, that occurred from July 10 – August 17, 1943. Allied leaders in the Sicilian campaign. 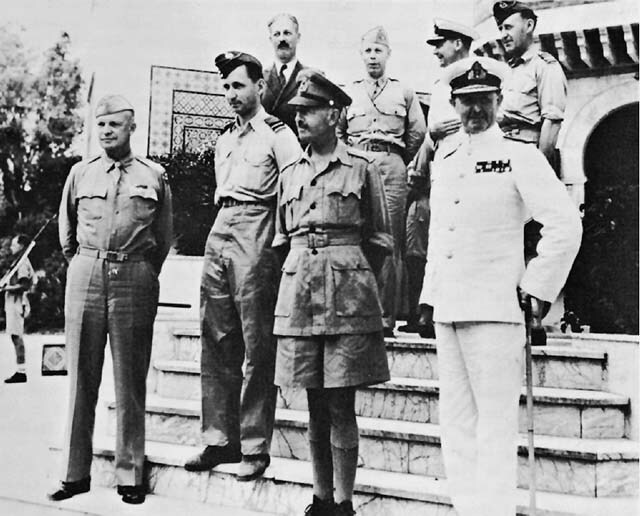 General Eisenhower meets in North Africa with (foreground, left to right): Air Chief Marshal Sir Arthur Tedder, General Sir Harold R. L. G. Alexander, Admiral Sir Andrew B. Cunningham, and (top row): Mr. Harold Macmillan, Major General W. Bedell Smith, and unidentified British officers. This is a map of the Allied army amphibious landing in Sicily, July 10th, 1943, as part of Operation Husky. 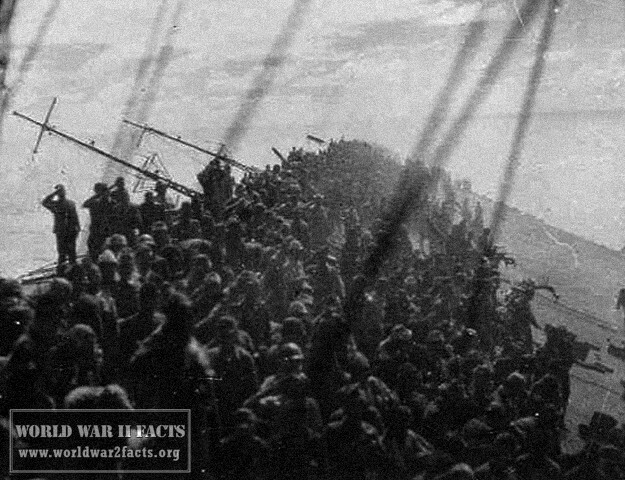 It shows the deployments of the landing forces and the German and Italian formations defending the island. After the Allies won the campaign against the Axis in North Africa, with most of the forces that battled in North Africa now available the Allies had to plan their next move. After some deliberation it was decided that it's time to attack the Axis front on - target - Italy. Sicily was chosen as the first part of the attack, it was a particularly attracting target because the Allies could count on cover from the air basses in British Malta which was some 60 miles on the south side of Sicily. During the Allied invasion of Sicily the SS Robert Rowan (Liberty ship K-40) explodes after being hit by a German Ju 88 bomber off of Gela, Sicily (Italy), on (11 July 1943). on a beach in Spain. He had a briefcase attached to his wrist that was full of secret intelligence about the Allies' plans. Sure enough that intelligence made it all the way to Adolf Hitler, who would go on to study the plans to the smallest detail. Using what he learned from the recovered plans he commanded that troops and ships be sent to the islands Sardinia and Corsica on the west of Italy. Using the plans he deducted that the Allies would start an invasion from there and he wanted to meet them prepared, but the Allies were one step ahead. The body found wasn't a British Marine, it was a homeless man that had committed suicide, so the British intelligence used his body together with the fake documents to trick the German military into doing exactly what they wanted. By the summer of 1943 the Allies were on their way to invade Sicily with a massive invasion force and the Battle of Sicily began. On the first days of the battle the Allies had 150,000 troops, 4,000 aircraft and 3,000 ships, all directed to invade Sicily. The invasion was nearly canceled only a day before because of an upcoming summer storm which could have caused serious problems for paratroopers that were set to drop behind enemy lines at night. The storm however actually worked to the advantage of the Allies because it was the opinion of the Axis leadership that no commander in his sane mind would attempt a landing during such a storm. By July 10, together with aerial and naval bombing of enemy positions 150, 000 troops landed on the shores of Sicily, bringing with them 600 tanks. 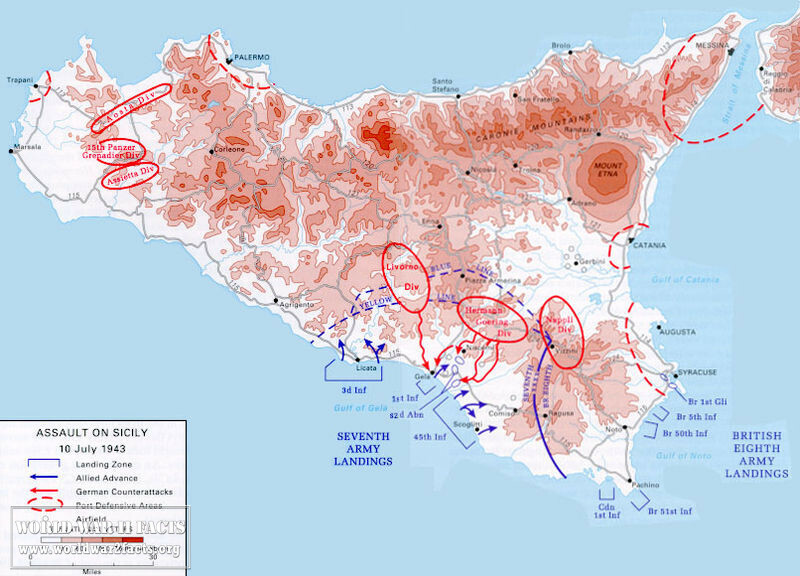 Thanks to the counter-intelligence planted before there were almost no forces left to defend Sicily, all but two German divisions were redirected to the other Islands leaving Sicily open for the taking. Even several days into the Battle of Sicily, Hitler still argued that it was just a diversion and continued to warm his officers to expect the real attack on the islands of Sardinia and Corsica. During the next five weeks the Allied forces would take almost all of Sicily and the fascist regime there acted just like they hoped. By July 24 Benito Mussolini the leader of the fascist regime in Italy was overthrown and arrested and a new provisional government that opposed the alliance with Germany was setup and immediately started secret discussions with the Allies about peace. 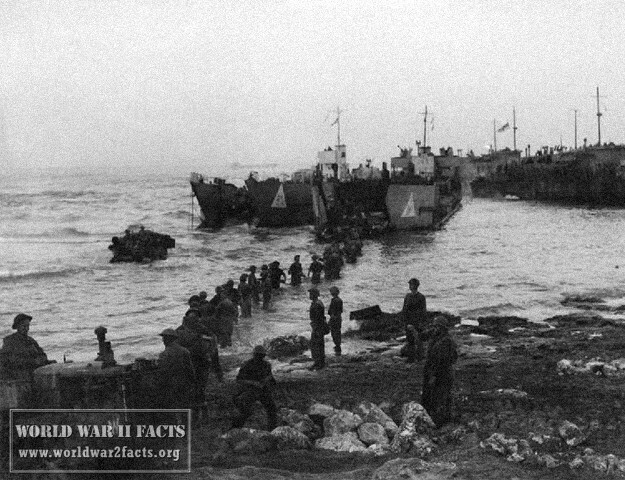 By the next day Italian troops already began withdrawing from Sicily and even Hitler instructed his men to start withdrawal but to continue fighting the Allied forces when they encounter them. 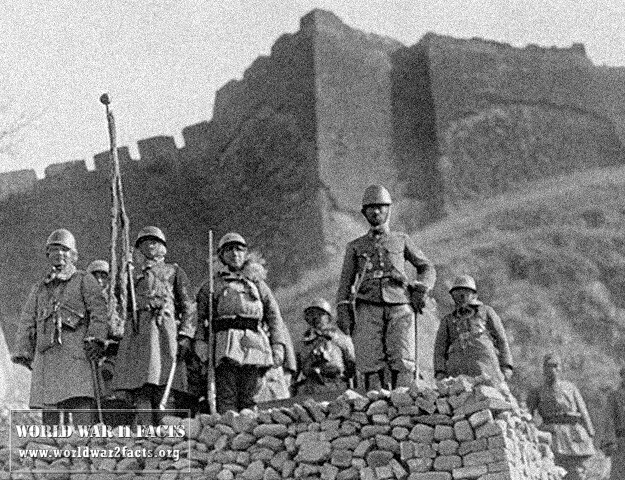 For the next few months the Allies would fight determined German troops that remained on Sicily and try to push them off the Island. 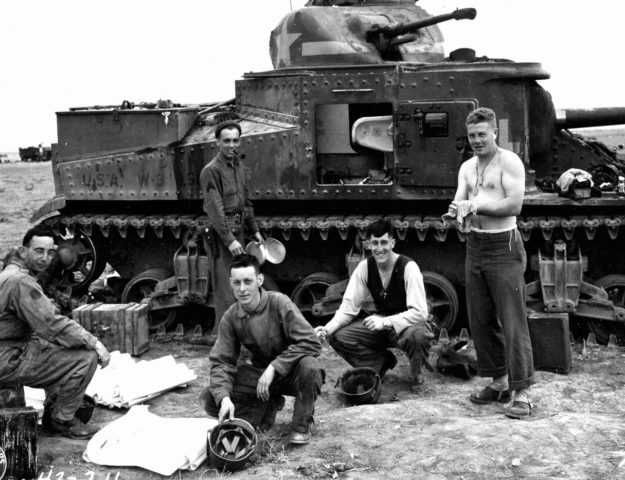 Crew from the tank "Eternity" check their vehicle after landing at Red Beach 2, Sicily. the island. 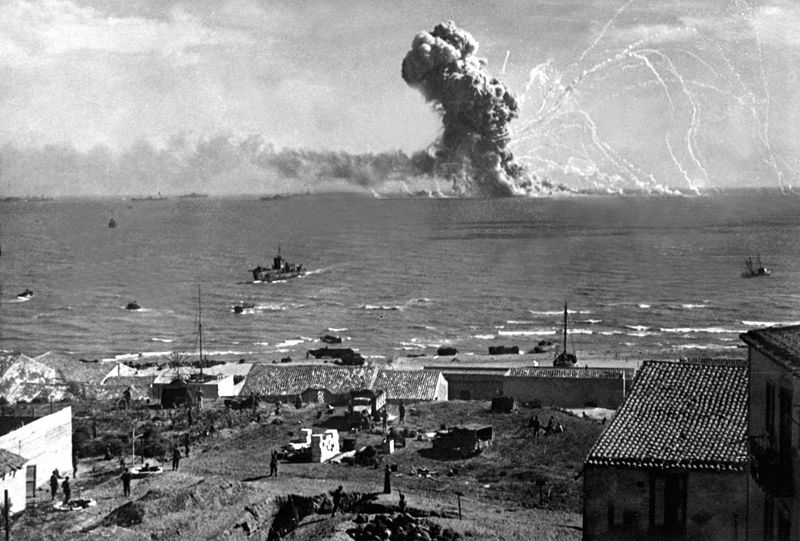 By this point the Battle of Sicily was more or less over as the Axis started to evacuate everything from troops to supplies from the island as soon as they could. 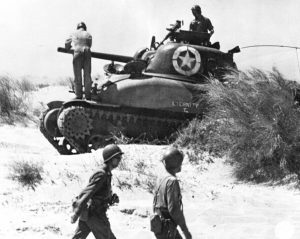 When the Allies expected to make one last push to drive the enemy of the island they found that the enemy had already left, thus ended the Battle of Sicily. For the Germans the battle wasn't as much of a catastrophe as it could have been, they didn't lose many troops but the Allies, even though they had won didn't manage to capture the fleeing Axis troops. The Allies would soon learn that this was an easy victory compared to the losses they would suffer in the invasion of the Italian mainland.